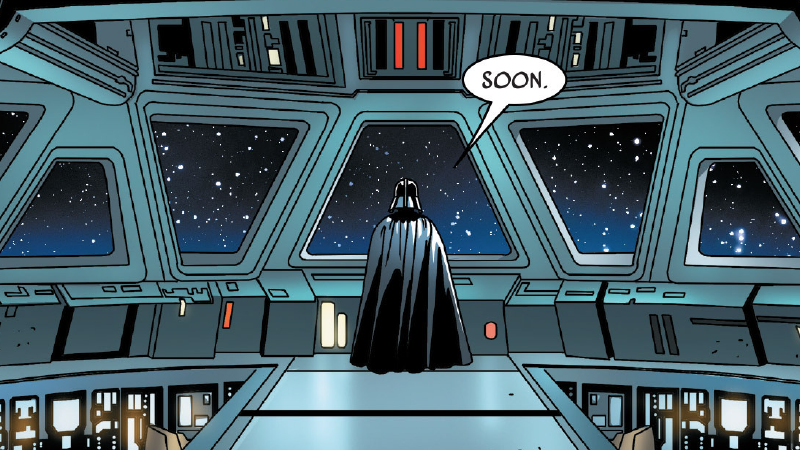 Today is a sad day for Star Wars fans, with the ending of Marvel's excellent Darth Vader comic from Kieron Gillen, Salvador Larrocca and Edgar Delgado. 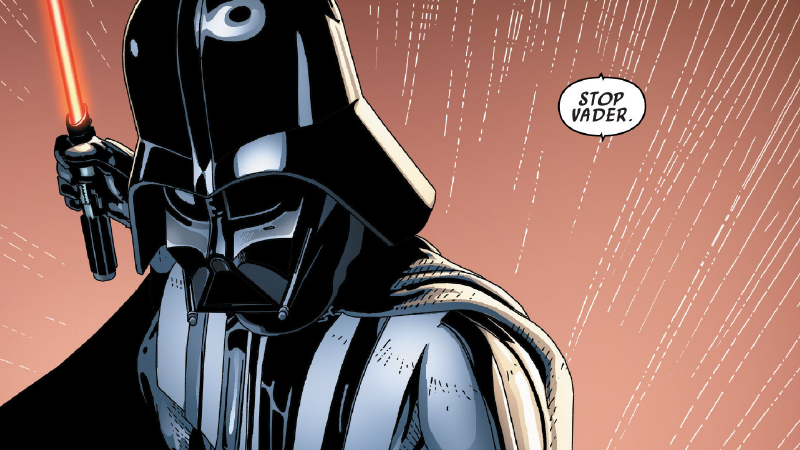 Vader has given us a look at the Dark Lord at his deadliest and most fearsome — and it came to a close giving us more of what made it so great, right down to the sick burns. The greatest strength of Darth Vader — aside from its incredible, delightful penchant for making its titular character extremely sassy — has been its invigoration of Vader as a truly fearsome presence in the Star Wars galaxy. Darth Vader is more than a cyborg clad in dark leather; he's a force of nature. Whether that's meant him skulking around in the shadows of the Empire to forward his own agenda or whether it's him carving through his opponents as an unstoppable body of pure, disciplined fury. 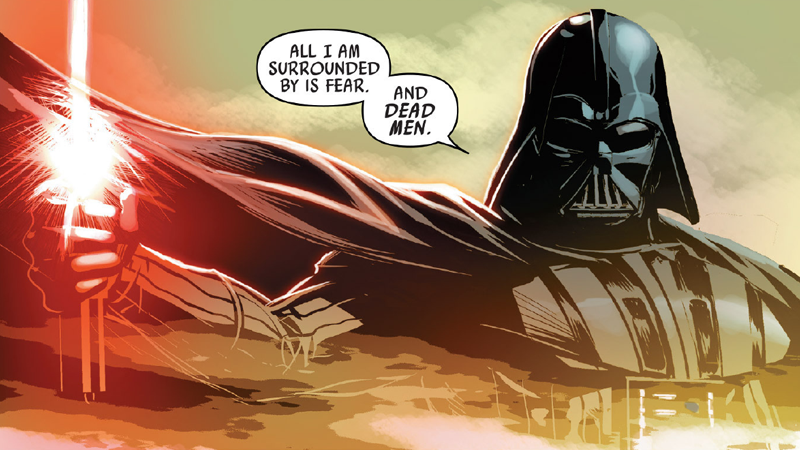 Vader Down might have been an ancillary spinoff, but it became the apex of Marvel's re-establishment of Vader as a man everyone should fear. Years of Vader's presence in popular culture had dulled the fright he was meant to instil — he's been adorable plush toys, cutesy advert inspiration, hell, he can voice your Sat Nav if you really want him to. As Darth Vader became one of the faces of Star Wars as a global marketing phenom, his fearful presence was blunted. He was the bad guy sure, but not all that bad — he could be kind of fun. 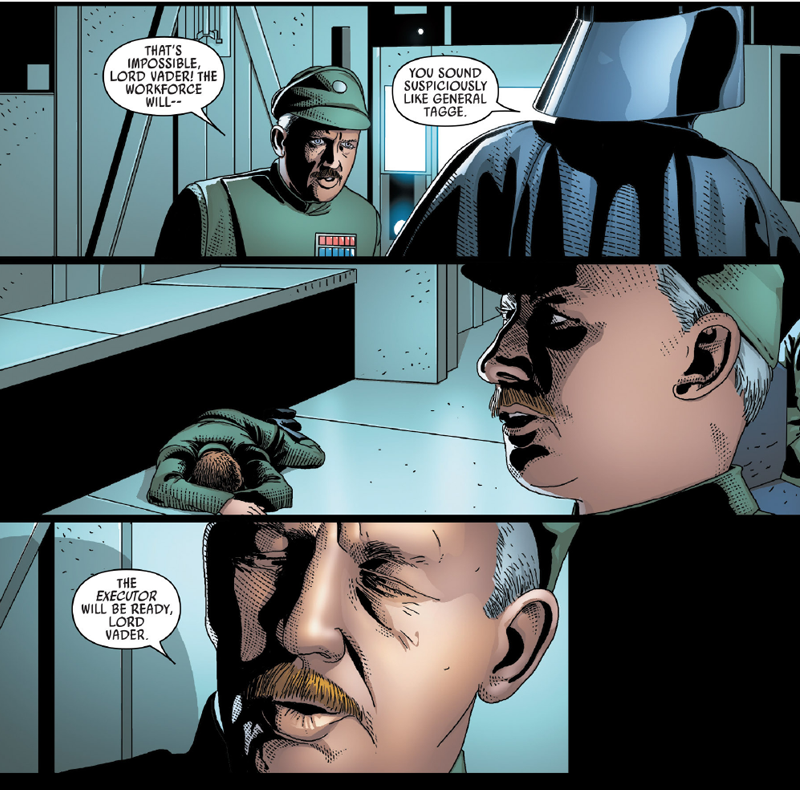 Gillen, Larocca and Delgado's work managed to blend the finest of lines between these two cultural perceptions of Darth Vader — fun enough that if he came out with a ballsy quip or a sassy put-down you'd have a chuckle, but otherwise this deadly, brutal force, choking and slashing his way through enemies with words or with his deadly mastery of the Force. Darth Vader breathed new life into Vader as a character, reinvigorating the horrifying figure of the movies while at the same time keeping him stunningly human. Darth Vader #25, out today, is a culmination of the outstanding work this creative team has done with the character, wrapping up its story while also managing to give readers an essential "greatest hits" recap of why the series has been so brilliant. In fact, its overarching plot — the defeat of sinister Doctor Cylo, who's spent most of the series creating new servants of the Emperor in a bid to unseat Vader from his position as right-hand man to Palpatine — is handled almost instantaneously. In Vader's brusque, violent manner, the Dark Lord single singlehandedly storms Cylo's flagship, butchers the Doctor's army of clones (delivering the issue's second-best put-down), and eliminates the threat once and for all. 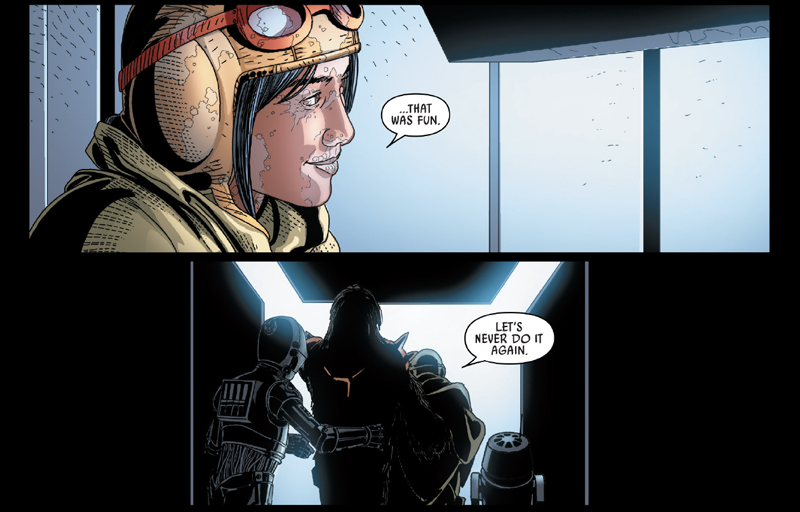 The rest of the issue serves as a wrap-up, Vader triumphant and on a victory lap. Vader's rewarded by the Emperor for his betrayals and sneaking behind Imperial backs — and for defying his master, the true sign of a good Sith — with his position re-instated and command of the Executor. It truly will be the burns I miss from this series the most. Darth Vader might be over, but the Dark Lord's journey in the galaxy far, far away is far from it. 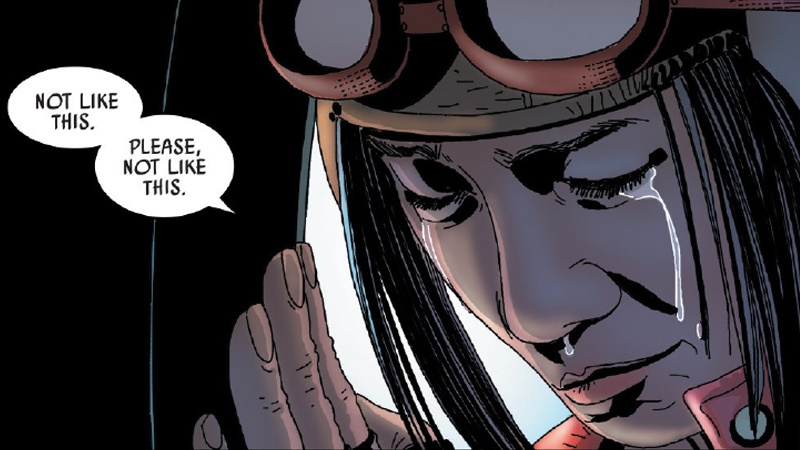 Let's hope Marvel can keep this excellent portrayal of one of Star Wars' finest going well beyond this series' end.